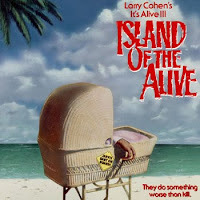 Much like the parents of the mutant babies in his films, Larry Cohen just couldn't let his killer baby franchise die. So, in 1987 this "killer" third entry rounded off the trilogy. With nary a flashback to John P. Ryan, and claymation taking the place of puppets in many instances, these babies are the most disappointing, though they may also provide the best laughs. Behold It's Alive III: Island of the Alive. Bill-I still think you are wrong about Bruno. Funny movie. Had to get a dig in at the end of the podcast?